Love International Festival is picking up where The Garden Festival left off with a banging party in the idyllic town of Tisco, Croatia. Stay up to date on Love International news on their Website | Facebook | Twitter and bag yourself some tickets before they're gone! 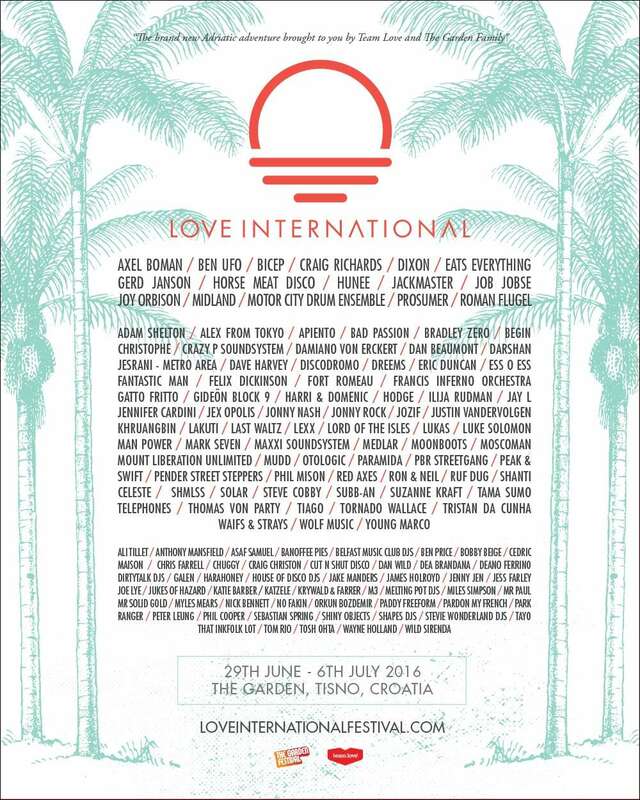 One of the most eagerly anticipated festivals on the Croatian circuit this year has to be Love International. 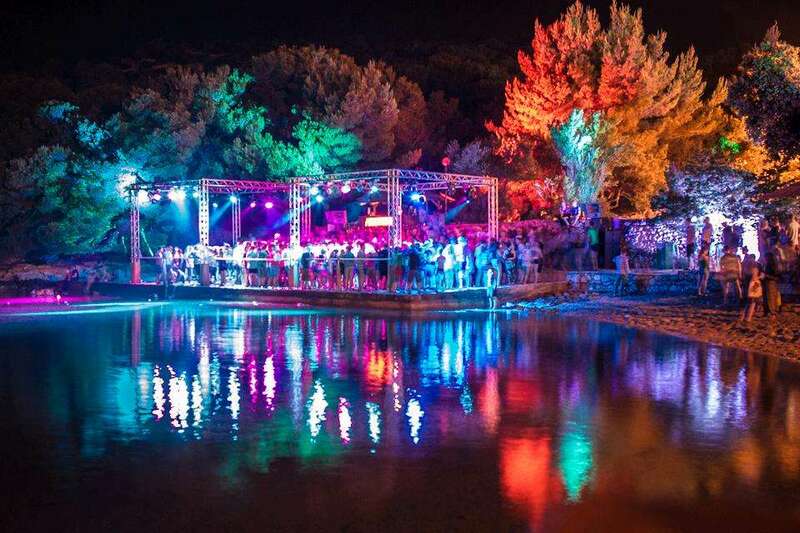 Following in the footsteps of the legendary Garden Festival, this house-flavoured festival is set in the idyllic town of Tisno, the place that the pioneering Garden Festival was set. Taking place 29th June and closing 6th July, Love International have now released their full lineup, with a few more treats in the pipeline as they still need to confirm who will be rocking their boat parties. Already confirmed for the festival were Motor City Drum Ensemble, Ben UFO, Gerd Janson, Craig Richards, Joy Orbison, Midland, Horse Meat Disco, Prosumer, Hunee, Tama Sumo, Job Jobse, Fort Romeau, Red Axes, Lord Of The Isles and Khruangbin, so expectations were set pretty high for this next release. Now, to complete the lineup they've confirmed some heavy-hitters including, Eats Everything, Bicep, Jackmaster, Roman Flugel, Axel Boman, Young Marco, Crazy P Soundsystem, Felix Dickinson, PBR Streetgang, Harri & Domenic, Jennifer Cardini, Darshan Jesrani, Maxxi Soundsystem, Luke Solomon and Dan Beaumont. Check the full lineup below. Axel Boman, Ben UFO, Bicep, Craig Richards, Dixon, Eats Everything, Gerd Janson, Horse Meat Disco, Hunee, Jackmaster, Job Jobse, Joy Orbison, Midland, Motor City Drum Ensemble, Prosumer and Roman Flugel. Adam Shelton, Alex From Tokyo, Apiento, Bad Passion, Bradley Zero, Begin, Christophe, Crazy P Soundsystem, Damiano Von Erckert, Dan Beaumont, Darshan Jesrani – Metro Area, Dave Harvey, Discodromo, Dreems, Eric Duncan, Ess O Ess, Fantastic Man, Felix Dickinson, Fort Romeau, Francis Inferno Orchestra, Gatto Fritto, Gideon Block 9, Harri & Domenic, Hodge, Ilija Rudman, Jay L, Jennifer Cardini, Jex Opolis, Jonny Nash, Jonny Rock, Jozif, Justin Vandervolgen, Khruangbin, Lakuti, Last Waltz, Lexx, Lord Of The Isles, Lukas, Luke Solomon, Man Power, Mark Seven, Maxxi Soundsystem, Medlar, Moonboots, Moscoman, Mount Liberation Unlimited, Mudd, Otologic, Paramida, PBR Streetgang, Peak & Swift, Pender Street Steppers, Phil Mison, Red Axes, Ron & Neil, Ruf Dug, Shanti Celeste, Shmlss, Solar, Steve Cobby, Subb-An, Suzanne Kraft, Tama Sumo, Telephones, Thomas Von Party, Tiago, Tornado Wallace, Tristan Da Cunha, Waifs & Strays, Wolf Music and Young Marco. Ali Tillet, Anthony Mansfield, Asaf Samuel, Banoffee Pies, Belfast Music Club DJs, Ben Price, Bobby Beige, Cedric Maison, Chris Farrell, Craig Christon, Cut N Shut Disco, Dan Wild, Dea Brandana, Deano Ferrino, Dirtytalk DJs, Galen, Harahoney, House Of Disco DJs, Jake Manders, James Holroyd, Jenny Jen, Jess Farley, Joe Lye, Jukes Of Hazard, Katie Barber, Katzele, Krywald & Farrer, M3, Melting Pot DJs, Miles Simpson, Mr Paul, Mr Solid Gold, Myles Mears, Nick Bennett, No Fakin’, Orkun Bozdemir, Paddy Freeform, Pardon My French, Park Ranger, Peter Leung, Phil Cooper, Sebastian Spring, Shiny Objects, Shapes DJs, Stevie Wonderland DJs, Tayo, That Inkfolk Lot, Tom Rio, Tosh Ohta, Wayne Holland and Wild Sirenda.